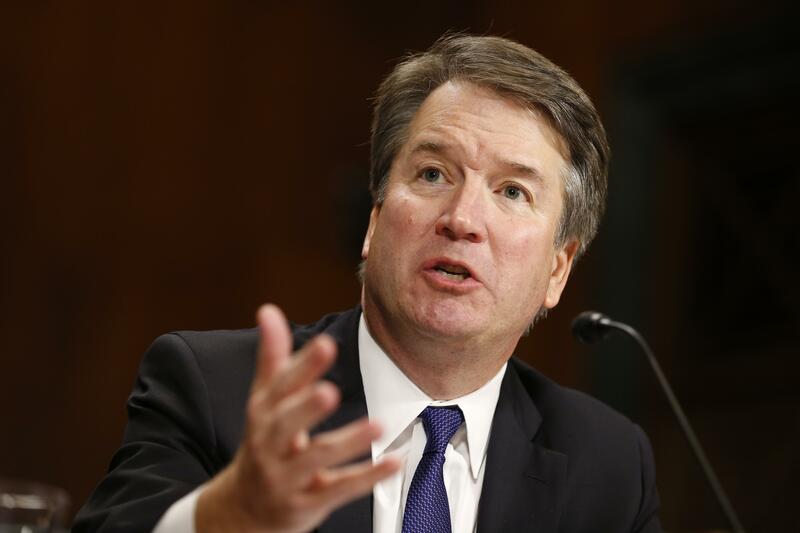 Supreme Court nominee Brett Kavanaugh was accused of throwing ice at a man during an altercation at a bar while in college. A report released Tuesday by police in New Haven, Connecticut, says Kavanaugh was questioned after the 1985 incident, but wasn't arrested. The report says 21-year-old Dom Cozzolino told police that Kavanaugh threw ice at him for "some unknown reason." Cozzolino said he then got hit on the ear with a glass. A witness told police the man who threw the glass was Chris Dudley, Kavanaugh's close friend. Chad Ludington, another Yale classmate, told The New York Times the altercation happened while they were drinking at a bar after a concert. Dudley and Cozzolino didn't immediately return messages from the Associated Press on Tuesday. The White House noted that Kavanaugh wasn't arrested or charged and questioned the incident's relevance. As President Trump was leaving the White House for Philadelphia Tuesday afternoon, he told reporters that Kavanaugh was "doing pretty well, it seems to me, over the last 24 hours." The president added, "A lot is going to depend on what comes back from the FBI." Last week, the FBI started a weeklong inquiry into sexual misconduct allegations against Kavanaugh, delaying a final vote on his Senate confirmation to the nation's highest court. Police spokesman David Hartman told reporters Tuesday the department searched its records for incidents mentioning Kavanaugh because of a request from the press. Hartman said no authorities have requested the 1985 report. "I do not have any information regarding any agency, law enforcement or otherwise an investigating body, that has contacted us for this police report," he said. "I'm not saying it hasn't happened, and I'm not saying it couldn't happen in the future, but thus far I'm just not aware that that has happened," Hartman said. Sen. Joni Ernst on Kavanaugh allegations: "We are innocent until proven guilty"
In Washington, Senate Majority Leader Mitch McConnell accused Democrats on Tuesday of opening "the floodgates of mud and muck" against Kavanaugh as Republicans sought to portray efforts to derail his nomination over the accusations as "the politics of personal destruction." The Kentucky Republican's combative remarks about Democrats came as Mr. Trump and lawmakers await the FBI's reopened background check on the 53-year-old jurist. Kavanaugh, whose confirmation has been thrown into doubt by the accusations, has denied the claims made by three women. McConnell's remarks also came as the FBI finished interviewing Kavanaugh friend Mark Judge, who was said to have attended a high school gathering in the early 1980s where Christine Blasey Ford says she was sexually assaulted by Kavanaugh. A lawyer for Judge, who has denied any wrongdoing, declined to say when the interview finished or what Judge was asked. McConnell said a vote would happen on Kavanaugh's nomination by the end of the week.